Every single day, a number of people find my blog on the Internet by searching for Washington Nationals prospect Bryce Harper. And why not? 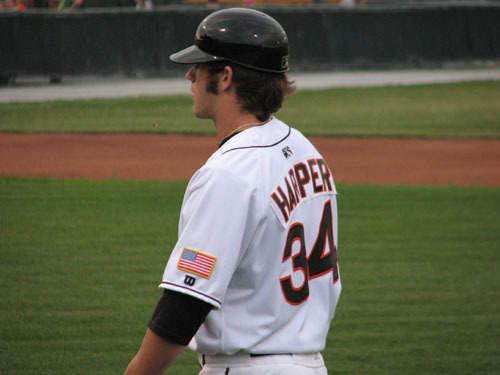 Harper is arguably the most exciting — and promising — baseball prospect to come along in years. Visitors to my blog find me by searching his name, his now-famous truck and his autograph. 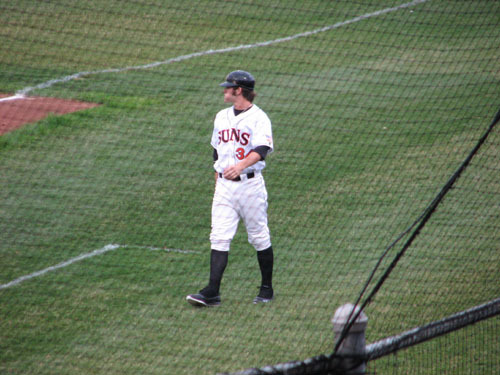 Fortunately, and the reason that people find my blog when searching for Harper, I got to see him last summer when he was a member of the Hagerstown Suns. 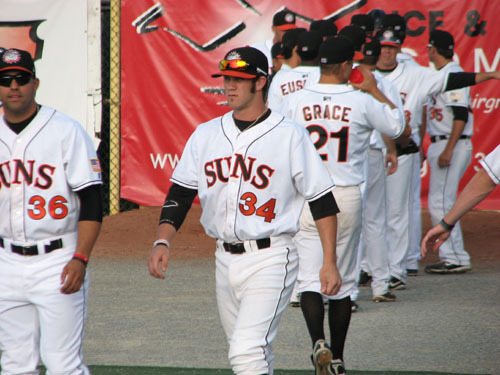 Back on June 27, I visited Hagerstown’s Municipal Stadium to watch the Suns against the Lakewood Blueclaws. Harper was nursing a minor injury and wasn’t in the lineup during my visit. 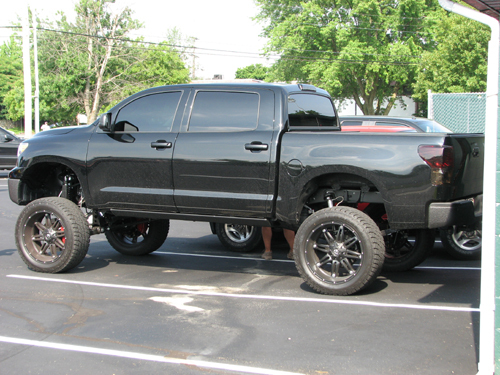 But as soon as I made it to the parking lot at the rear of the ballpark, I saw his truck and knew he was around. This was pretty cool to see. I’ve since seen Harper post pics of his vehicles on his Twitter feed, but this was the first time I saw his ride in person. I was hoping for an autograph, but as you can tell from the sequence above, Harper came toward me and kept walking. He even stood waiting as a veteran climbed all the way down from the top of the bleachers to get an autograph. Not exactly the type of behavior that some in the media are focusing on, is it? I’ve collected baseball cards for a good chunk of my life and while it’s somewhat tempting to share a bunch of my best cards here, I don’t want this to turn into a baseball card blog. 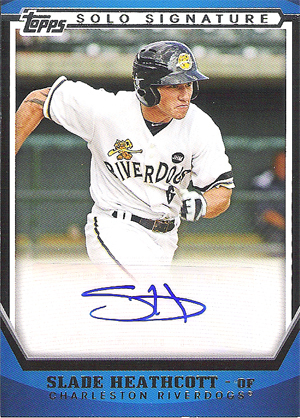 I can, however, show a few cards from the 2011 Topps Pro Debut set that I picked up last summer in the team shop at Ripken Stadium, home of the Short Season A Aberdeen IronBirds. How cool is it that a ballpark’s shop sells Minor League Baseball cards? I’ve seen some MLB parks sell waaaay overpriced cards, but I think it’s awesome that Aberdeen sells cards that are geared to the Minors. 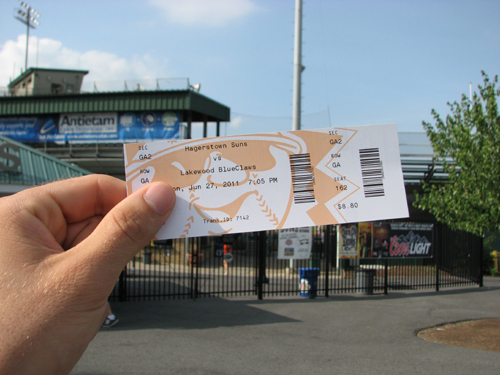 Imagine sitting at a ballpark on a summer night, watching a game, eating some amazing seafood and opening a few packs of cards. It’s all part of the experience in Aberdeen. In four packs, I pulled two autographed cards, which means I did pretty well. 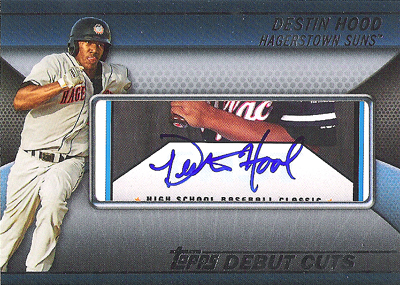 In his young career, 21-year-old Hood has played with three teams I’ve seen in action: the Vermont Lake Monsters, Hagerstown Suns and Potomac Nationals. 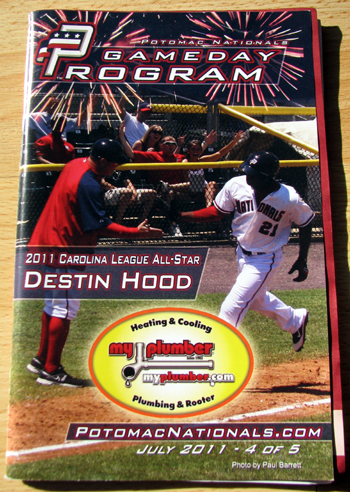 Hood wasn’t in the lineup when I saw Potomac play on July 1, but he was on the cover of the gameday program I picked up. Harpermania, otherwise known as my visit to see the Hagerstown Suns, began about 2 p.m. on June 27. I’d been in my hotel all morning and was getting a little stir-crazy. So, I decided to go out and grab some lunch, then check out Municipal Stadium, home of the Suns. I didn’t expect to see much going on five hours before first pitch, but I wondered if I’d be able to find a ball beyond the outfield fence. So far, I’ve managed 12 balls in four games, and wanted that streak to continue. 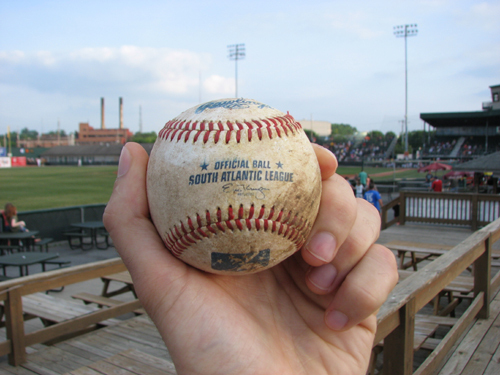 More importantly, however, this would be my first game in the South Atlantic League, and I really wanted a SAL ball to add to my collection of balls from different leagues as I continue to hit different leagues through my travels for The Ballpark Guide. So, no balls. I took another brief look around and headed back to my hotel to wait for a couple more hours. 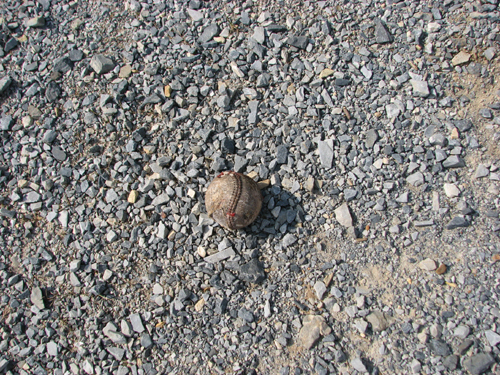 It was an old, scuffed ball with part of its leather missing. I didn’t bother picking it up, nor did I find any other balls back here. Want to guess who it belongs to? 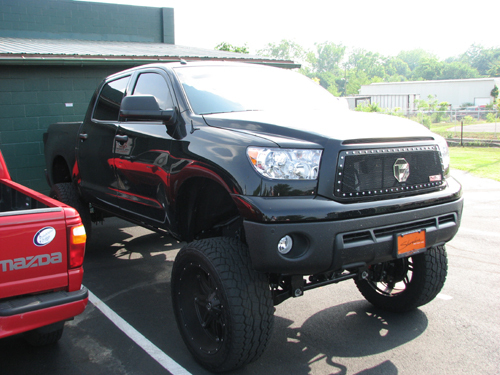 Yep, it’s Harper’s truck. 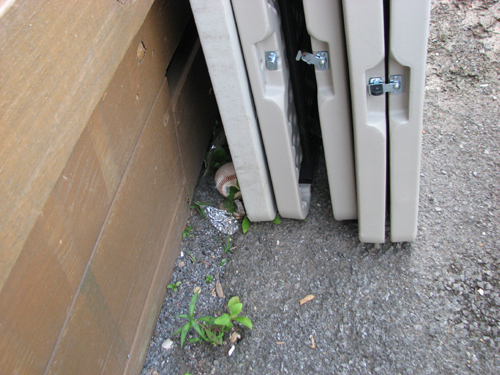 I saw this truck parked discretely (as if the thing could ever be discrete) behind the grounds crew’s hut. The other players all parked in the lot in front of the stadium, but Harper gets hounded so much that he obviously parks back here. I should note that once I saw this truck (and confirmed it was Harper’s due to its Nevada plates), I was unsure about posting these photos. I didn’t want to infringe on his privacy and show everyone what he’s driving. 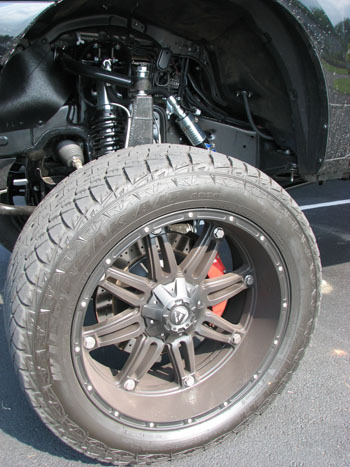 I Googled “Bryce Harper truck” and there are news stories, blogs, YouTube clips and all sorts of stuff online, including photos, about his truck. So, it’s not as though I’m breaking new ground here. 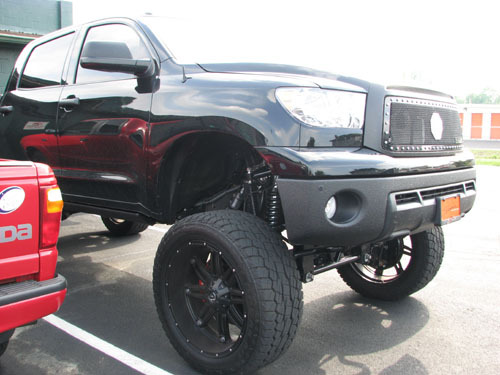 By the way, it’s a 2011 Toyota Tundra completely customized. I turned around: “It’s a matter of insurance. If you go in before you’re allowed, and hurt yourself, the team might not be insured because fans weren’t supposed to be there.” It’s the same reason you can’t go into the bank five minutes early. Rules are rules. Anyway, bitter, annoying people aside, the gates did indeed open when they were supposed to, and I went in. Normally, I take a quick tour to get my bearings, but this time, I wanted to get straight to the Suns clubhouse area to try to get Harper to sign something. Not that this idea was original — everyone else went for it, too. 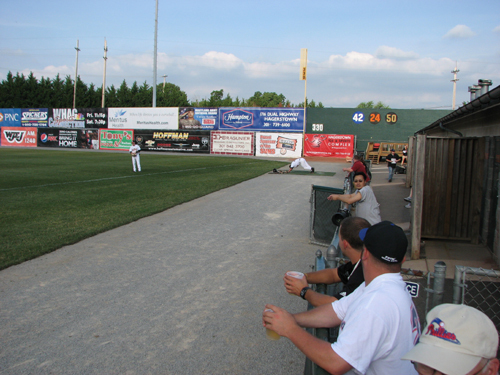 The players come out of the clubhouses on the right and make their way past you to the dugouts. 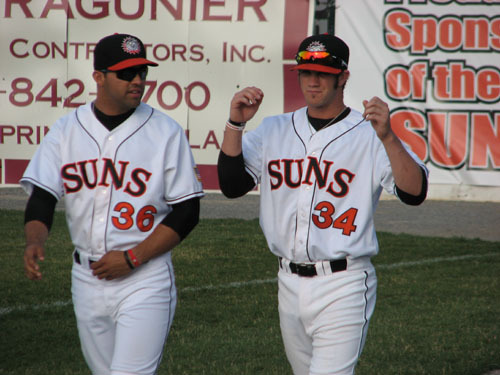 As much as people wanted Harper, there was an equal enthusiasm for the Suns’ starter, who was Hagerstown on a rehab start. Who was it? 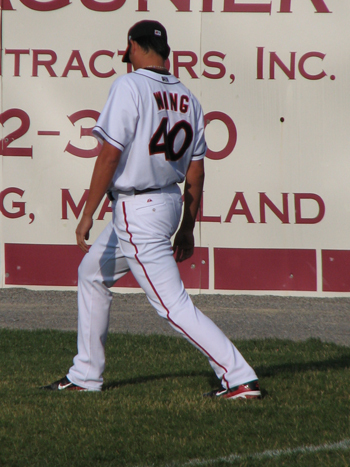 None other than former Yankee Chien-Ming Wang. This was his first appearance in the Washington Nationals organization since joining the franchise, and people were ecstatic. There was a sizable Taiwanese media contingent and a ton of fans who’d flown from Taiwan. I asked a couple how long it took, and they said 24 hours. 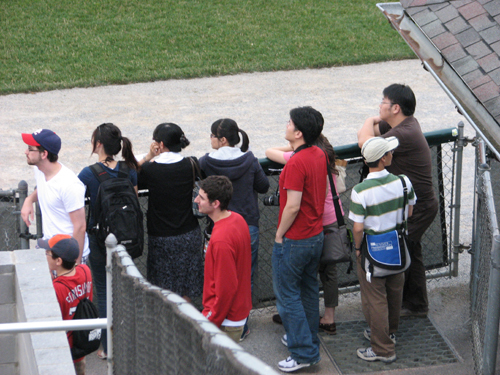 Being a rehab start, Wang was scheduled to pitch just three innings — talk about dedicated fans! 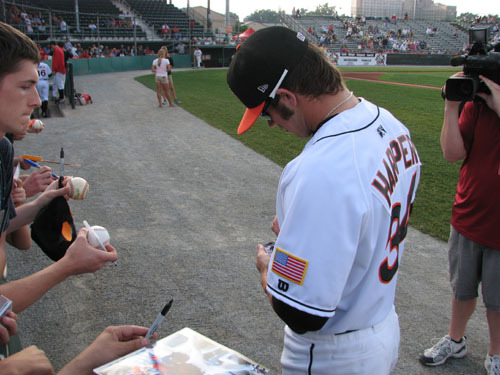 Here’s what I hate about autograph collectors: They make life a living hell for guys like Harper. Yes, the kid is a public figure, and yes, he has an obligation to his fans. But you know a huge percentage of the autographs he signs are going on eBay within 24 hours, and he knows it, too. “But he’s a millionaire,” people say, “Why should he care?” Would you want someone profiting off your name without being compensated for it? The longer Harper didn’t appear, the more angry people became. A minute earlier, they would’ve hand-cleaned his jockstrap for a signature, calling him “Mr. Harper” and “sir” while they did it. Now, it was, “Who does he think he is, staying in the clubhouse?” He’s staying there to keep the heck away from you vultures! One final rant about this: People have elaborate schemes to get him to sign. Many use their kids. I heard one guy telling his five year old how he’d buy the kid the “biggest ice cream ever” if the kid could get Harper to sign. Others drop items at the player’s feet so he’ll pick them up. Others justify their actions, saying, “He asked for this life.” Freaking brutal, people. I guess, all this to say I feel bad for Harper and those like him. He’s a prodigious talent and has been in an intense spotlight since he was a kid. Wouldn’t you think that in his first year of pro ball, he’d rather be out stretching and playing catch with his teammates? Instead, he’s hiding in the clubhouse until the last possible second. Sad. 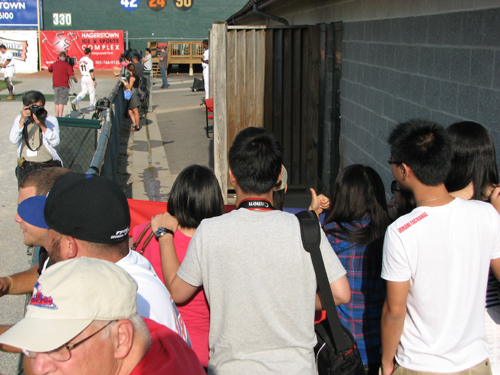 After signing maybe 25-30 autographs, he went into the dugout and the crowd dispersed. 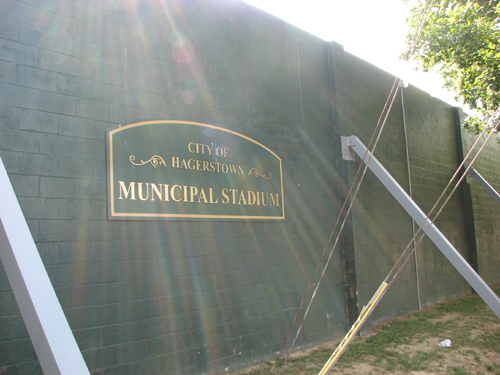 I took this opportunity to go check out Municipal Stadium’s team shop. So far, my collection includes balls from the Major Leagues, Eastern League, Midwest League, International League, New York-Penn League and now the South Atlantic League. I couldn’t be more excited! I sat in a few different areas throughout the game, and despite Municipal Stadium being one of the oldest ballparks I’ve attended in a while, it was neat. There are some drawbacks, but lots of perks, too. The menu looked impressive, with a wide range of items. I decided to skip a meal, however, as the thought of another consecutive day of ballpark food wasn’t really appealing. 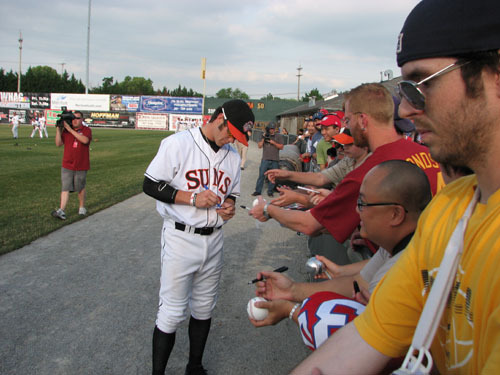 … and even gathered in the parking lot late in the game in the hopes of meeting him. 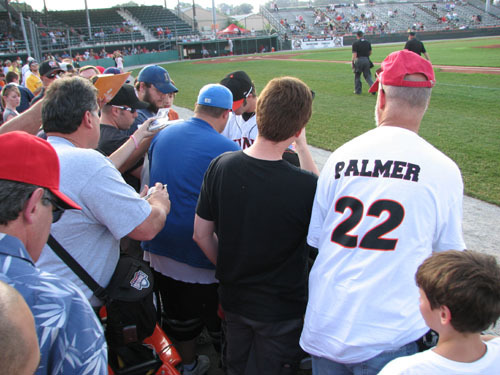 After the game wrapped up, I waited with other fans along the first base-side fence, hoping that Harper would sign more autographs. 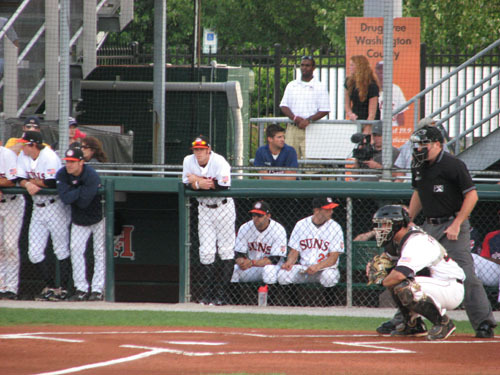 Somehow, he pulled a total disappearing act; none of us saw him walk by, but pretty soon, the field and dugout were completely empty. Obviously, there’s no tunnel connecting the dugout and clubhouse, so he either left way early (and none of us noticed) or he hunkered down in the dugout, out of sight, until everyone left. Anyway, when it was clear he wasn’t going to walk by, I went out into the parking lot and milled around the entrance to the stadium, where the Taiwanese fans were hoping to see Wang. I waited maybe 10 minutes, and a staff member walked by and told he Wang wouldn’t come out through this door. I figured I’d just head back to my hotel for the night, but then had a better idea. 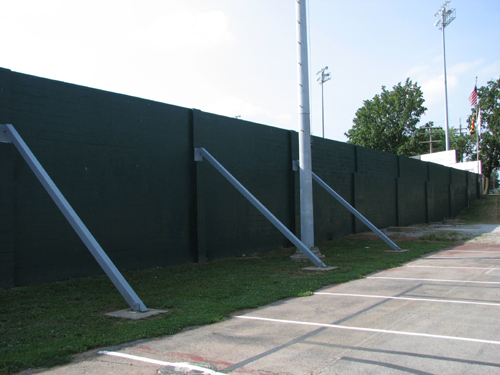 Then I had the thought of going back to the rear parking lot to see if Harper would sign. I decided that if there were others there, I’d wait with them. If no one was there, I’d let Harper be. There was just one guy standing around with his daughter, so I waited to see what would happen. 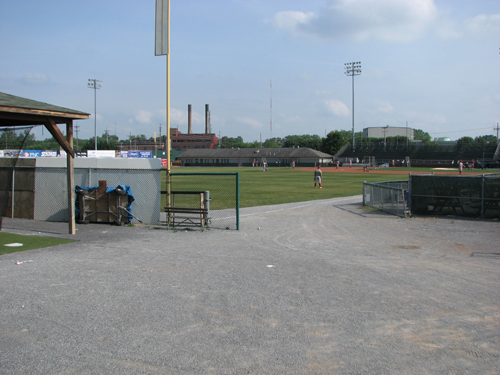 Maybe 20 minutes later, or about 40 minutes after the game ended, the rear door opened and a clubhouse attendant stuck his head out. “Sorry, guys, he’s not signing tonight,” he told us. Harper emerged a second later and it was cool to see him so close. He went straight to his truck and met with a couple buddies for a minute. 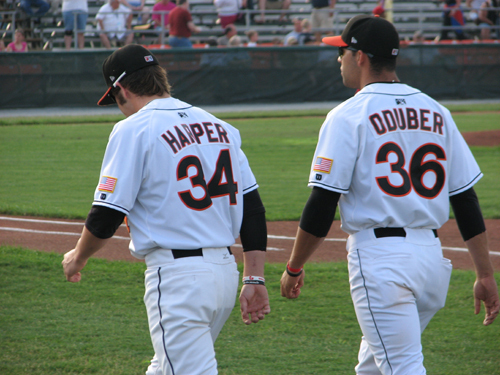 Then, one of the guys said, “I’ll let you sign for these guys and then they can go on their way,” and Harper nodded. He signed a pair of autographs for the first guy, then I asked if he would mind signing a ball for me. He nodded again. 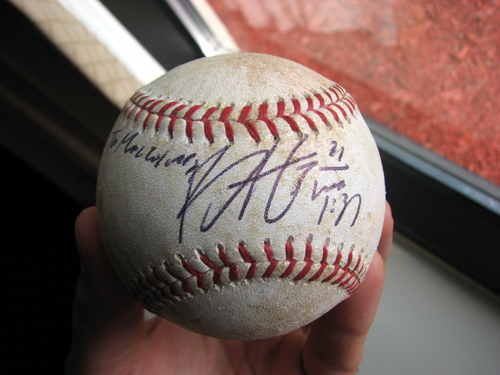 I didn’t want to look like a professional autograph seeker, so I asked if he’d make the ball out to me. I spelled my name for him and told him I’d come all the way from Canada. “Cool. Thanks for coming,” he said, and handed my newly signed ball back to me. He was really polite — quiet, but polite. People rag on him for having a supposed attitude. I read an interview with his dad, who said he taught all his kids to “be like John Wayne on the baseball field,” and that’s what Harper is. Call it what you want; he’s immensely talented and confident in his skills. Don’t forget he’s only 18, too. That’s what people forget when they criticize people younger than them. Getting his autograph made my day, and is the highlight of my trip thus far. I liked what I read about this kid when I first read that Sports Illustrated cover article two years ago, and now I’m an even bigger fan. 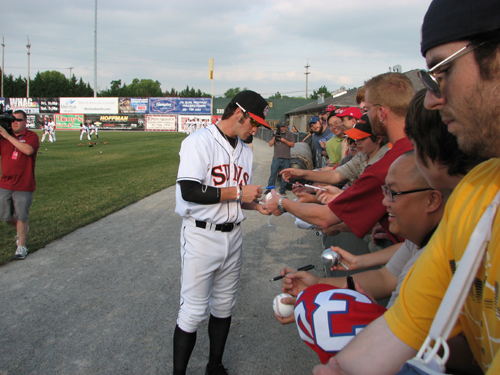 Thanks, Bryce, for taking the time to sign and best of luck in your career. Don’t let the idiots who complain about you get you down.